Osato et al. (DOI) have signed on for Oseltamivir total synthesis number 27 (previous episode here) even though it is clear by now that the drug Tamiflu is totally ineffective against the dreaded swine flu. Nevertheless this particular synthesis has several interesting features notably its start from humble and widely available ribose 1. Reaction with pentanone and methanol gives mono-ol 2 and an Appel reaction (triphenylphosphine/iodine/imidazole) replaces the alcohol group with iodine in 3. The next step is a zinc initiated Bernet-Vasella reaction which opens up the ribose ring. The intermediate aldehyde 4 is not isolated but reacted with ethyl 2-(bromomethyl)acrylate 5 in a reformatski reaction to diene 6. Olefin metathesis is next accomplished with using a Grubbs-Hoveyda catalyst (2 mol% loading!) to cyclohexene 7, ketal cleavage proves difficult (poor selectivity) but AlCl3 in combination with Et3SiH save the day for 8. Another narrow escape presents itself when it is found to be possible to first add a mesylate group in 9 (MsCl, Et3N) and then a triflate group in 10 (Tf2O, pyr) on the two adjacent alcohol groups (keep temperature really low!). 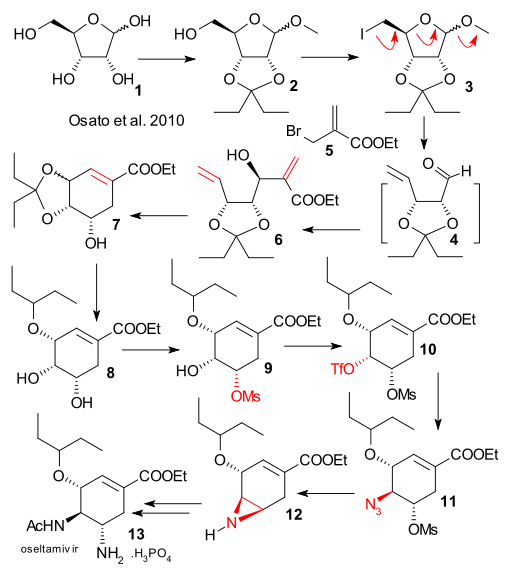 In the final section the triflate group is replaced by azide in 11 (NaN3, water/acetone), stauding reduction forms the amine and reaction in triethylamine forms the azirinidine 12 (total yield from ribose: 28%) which is only three known steps away from oseltamivir 12.